My youngest has a newish interest in the Solar System and I must admit I am enjoying the new topic. We have had fun learning about the different planets, looking at clips showing the size difference and talking about the huge distances in space. He recently started talking about which planets had moons and I immediately thought it would be a good time to learn a bit more about Earth’s moon. One of the things we read about was the different phases of the moon so I printed out the Activity Village Phases of the moon page for him. And then I spotted the Phases of the Moon Mobile and the Phases of the Moon matching cards and wondered if we could use the matching cards to do a similar type mobile. 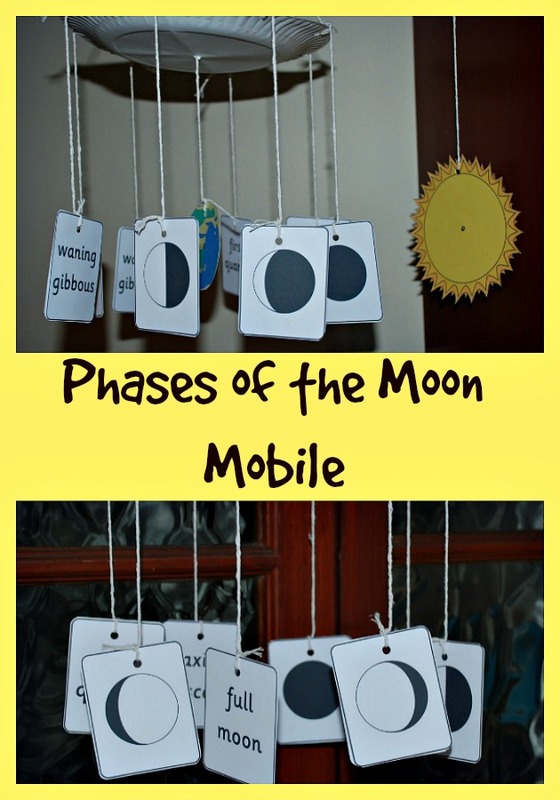 My thought was I wanted to show the phases of the moon but I wanted to attach the words to each picture (I keep forgetting which is which so I thought it would help the kids to have something which shows the names of each phase together with the picture). So I started by matching the correct words to each picture of the moon’s phases and glued them together. I first created a simple string handle – using two pieces of string – I attached one to what would be the North and South hole in the plate and the second string to what would be the West and East hole of the plate. And then I used the hole punch to create holes at the top of each moon phase card and tied each card to the paper plate using our string. But my youngest pointed out that we need an earth and sun. And I totally agreed. My son had the idea of using the earth and sun from his orbit model (And let’s be honest – this is a visual representation of how the moon phases change so the moon and the earth and the sun are not in Proportion but he wanted to show where the Sun and Earth would be). I must admit I think it ended up being a great visual way of showing how the moon changes based on its position in relation to the sun and earth. 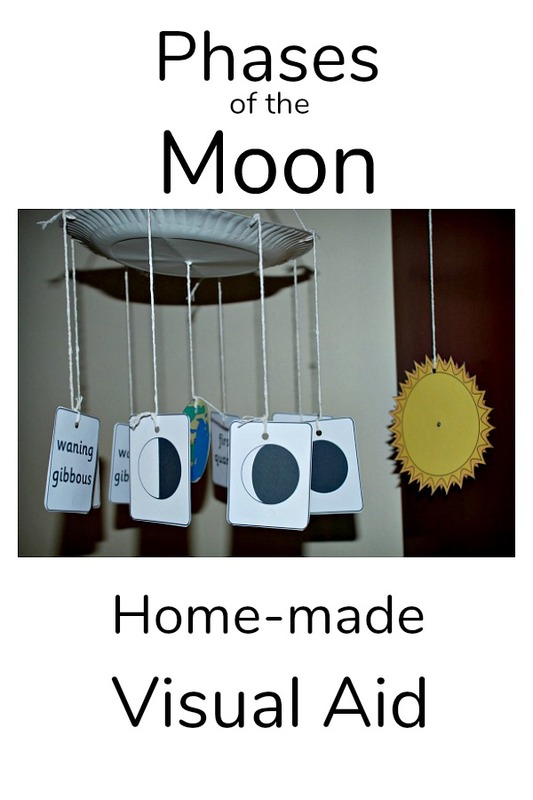 This entry was posted in Homeschooling and tagged activity village, home ed, home education, homeschooling, phases of the moon, solar system. Bookmark the permalink. Well done mom….I am sure the children learnt a great deal from this example…..